We know Oregon’s employment growth accelerated in 2013 and while the U.S. continues to add jobs at a 1.5-2 percent annual rate, Oregon is now up around 2.5 percent. This marks the strongest growth rate differential between Oregon and the average state in 7 years. Oregon’s economy is usually more volatile than the U.S. overall as the state falls further in recession but tends to grow more quickly in expansion. 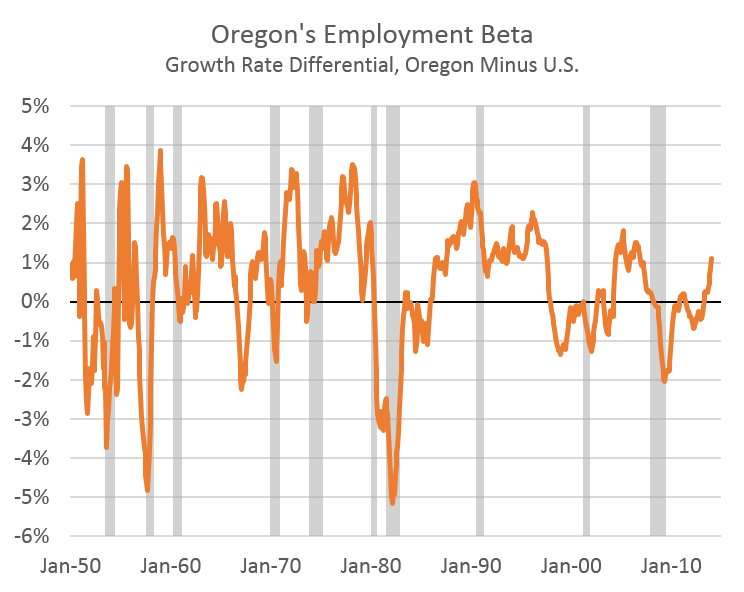 If the timing between business cycles is long enough (or the growth strong enough) Oregon typically comes out ahead on net, even with the more pronounced swings. Our office routinely discusses these two aspects of the economy with the Governor’s Council of Economic Advisors and we borrow from the finance jargon when talking about the state’s alpha (stronger on net) and beta (more volatile). 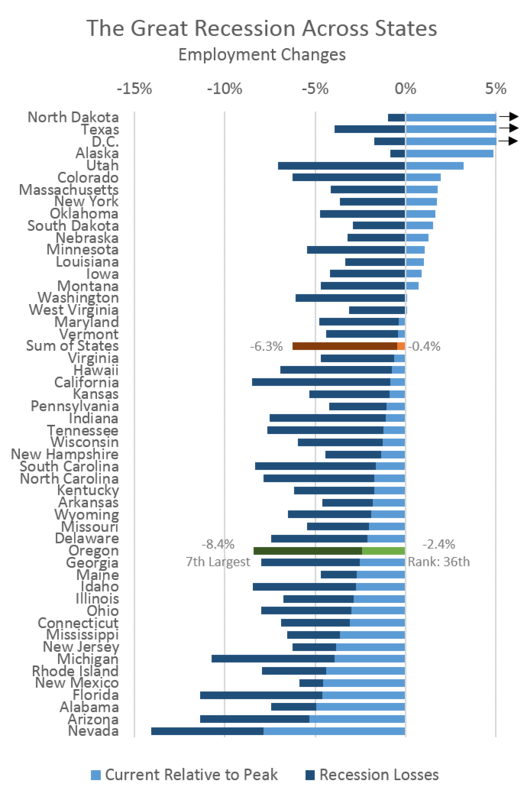 The graph below plots Oregon’s employment beta* as it shows Oregon’s net growth rate position relative to the nation. When the orange line is above zero, Oregon is growing more quickly, when the line is below zero, Oregon is growing more slowly or losing more jobs than the average state. While Oregon’s trajectory has improved quite a bit and the state currently ranks among the Top 10 fastest growing in the country, there is also more ground to make up locally as the state fell further in recession than most others. Specifically, Oregon experienced the 7th largest job loss across the country and while we are getting there in terms of regaining these losses, Oregon is not yet back to pre-recession levels of employment, let alone underemployment and other measures of labor utilization. To sum up current conditions, Oregon is once again growing more quickly than the U.S. overall and making up lost ground after falling further in recession. This is, by and large, the typical pattern the Oregon economy follows. Should the expansion last long enough, expectations are for Oregon to come out ahead when all is said and done. The state is clearly not there yet, but the trajectory has improved to the point where we are getting there. * This is our office’s quick and dirty beta measure. The official, statistical measure is a single value and does not show the time series aspect as the graph above, but the concept is clearly the same.